A gentle breeze blows through my backyard...creating a plume of yellow pollen in the air. While those that suffer from allergies are reeling in horror...all I can think of is how each gust is robbing me of my precious harvest! 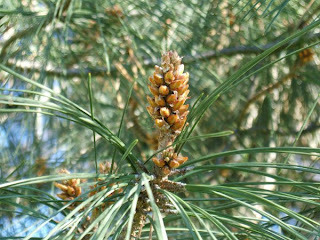 The pollen plume is coming from the male cones on my Gray Pine (Pinus sabiniana). So I ran to my kitchen...grabbed some plastic bags and some clippers. I cut the male cones off gently as to not shake out too much pollen...then I drop it into my plastic bag. This time I filled 4 bags with cones. Afterwards I will sit and using my middle finger...I flick the pollen off of the cones into the bag. Later I will put the pollen and remaining debris into a flour sifter to get rid of cone pieces and any bugs. (and bugs are common...because they know a good thing!) Don't leave the cones in a plastic bag for long...because they have moisture in them which will condense inside the bag. So why do this? Well...it is highly nutritious. It is high in protein and reportedly in testosterone! It is really fine so it doesn't require milling which is nice...so it can be added directly to most anything you are baking. It also is a really cool bright yellow...which turns the things you bake...well...bright yellow! Last season my children marveled at their yellow pancakes on the way to school. I just used part wheat flour...and part pine pollen in the pancake recipe. I should also mention that in my opinion...it also tastes good! If you have a pine tree near you...you ought to try it out. Do know that the window of opportunity can be fleeting as in just a few days...the wind can blow it all away. Happy foraging! I spent the day with my Buckeye Gathering friend Matt Berry and family on Saturday! He and his wife operate "Sierra Living Skills" up in the Grass Valley area. 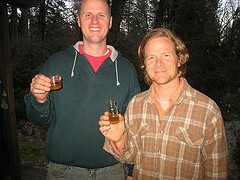 They are starting up a wild foods CSA and are running all kinds of primitive living skills and other related classes. Check out the link to their site to see what they have going on. Great people doing very worthwhile endeavors. He is also going to be one of the instructors on a Morel hunting class that will be held in May for forageSF that I will be attending...as well as an instructor at Buckeye this year. I had a wonderful time with them...chatting about some of my discoveries tinkering around pressing acorns for oil...and all kinds of other plant stuff. I'll tell you...a lover of ethnobotany can end up feeling kind of like a stranger in a foreign land with no one to talk to. So when someone can actually speak the common language...it's rather therapeutic and invigorating! You can read about our visit in a fun article that Matts' wife Rachel put together at the link above. Come to Buckeye this year and you can make friends like these too! While I have been doing foraging on my own...I haven't been scheduling any walks with others for several months. That break ends this Saturday! I'm going to do a walk on the Hinkle Creek Nature Trail at 1pm at 7100 Baldwin Dam Road, Folsom, 95630. We'll meet in the parking lot in front. It's just thrown together...and a last minute invite...so there should only be a handful of people. This walk can be free...or you can donate something towards my addiction to Amazon books! Whatever. The rains are falling...and things are a-growin! I have noticed lots of Erodium starting to poke up...as well as miners lettuce. A couple of my favorite greens. I love the Erodium cooked up in an omelette. It is very spinach-like. I also drink lots of Miners lettuce smoothies. I've sampled various species of Geranium. The texture seems to be a lot more palatable when it is young. It can have a peppery kind of taste. I have also been having a great time finding various mushrooms and figuring out what they are from ID books. 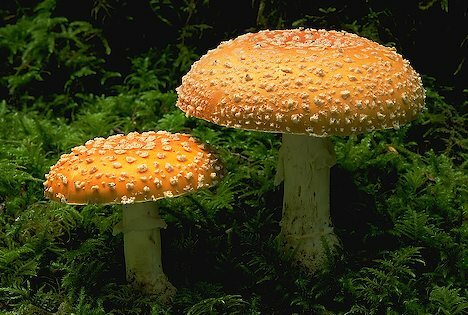 After 100%...beyond a doubt...I would testify in court...ID'ing of a species of "milk cap"...I took a small bite of it as outlined in Mushrooms Demystified. If it is "acrid" (peppery)...then it should not be consumed. IT WAS! Boy...I had to wash my mouth out. Almost like eating a hot pepper. One of the things that is really blowing my mind with regards to mushrooms is the rainbow of flavors that are found in mushrooms. They don't all taste like the bland button mushrooms from the store! Flavors of lemon...licorice...maple syrup...red hots...etc...can be found in mushrooms! As well as all sorts of flavors that are uniquely theirs. Tell people that you are eating wild mushrooms...and expect to have people afraid for your life! Kind of like telling people you just bought a new motorcycle! Few things strike fear into peoples hearts as much as wild mushroom eating. While many cultures the world over have enjoyed mushrooms for eons...public opinion in the united states has generally turned against the practice. So true! That is why wild mushroom consumption is not for the careless. Misidentify...and you could die...it could jack up your liver...or make you see strange new worlds...etc. That is why proper identification is of paramount importance! I'm sure it has happened. Even the "experts" can make mistakes. Thankfully...those kind of mistakes are the ones that have added to our knowledge regarding what can and can't be eaten...and it gets put into the next book. It is interesting to note that of the 1000's of mushrooms in the US...David Arora who wrote "Mushrooms Demystified" states that only 5 or 6 are the kind that will drop dead kill you. Alexander Schwab who wrote "Mushrooming Without Fear" adds to that point by saying that those mushrooms all have gills. This knowledge can help to curb the fear associated with wild mushroom consumption. So why do "experts" die? Well...more than likely because they venture off into consuming varieties that are not as easily recognized. 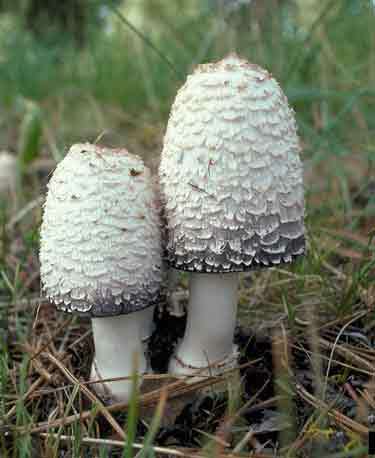 For example...eating the "Springtime Amanita" purported to be one of the most tasty mushrooms...which bears a striking resemblance to the "Destroying Angel" which is one of the the worlds most deadly mushrooms. Now...can you tell the difference between an elephant and a zebra? How about a carrot and a radish? A Golden Retriever and a Chihuahua? While there are mushrooms that look very similar...many of the best ones to eat have...have easily recognizable features...that with some patience and education...one can comfortably harvest them and eat without fear. So why go through the trouble to harvest wild mushrooms? 1. Most people generally think of "mushrooms" as only the flavor of the button mushrooms they can get at the store. In reality they come in all kinds of flavors! As well as textures. It is because of this that many of these mushrooms are served at the fancy expensive restaurants. 2. It is fun to look for them. It's like a treasure hunt that gets you out experiencing nature. It gets you to slow down and really look. 3. Wild mushrooms do actually have valuable nutritional value. I had long believed otherwise until I read reports of varieties having more potassium than bananas...trace minerals...and other good stuff. They also can have medicinal value. If you are interested in getting into harvesting wild mushrooms I would suggest a few things. 1. Check out a bunch of books from the library on the topic and learn. If you find you are serious about it...you will want to have some of those books as a part of your collection to take with you to help ID the specimens you find. 2. Approach it with complete caution! Don't eat anything! Just learn for a while. 3. Go out with mycologists that can teach you! Here is an event coming up in my neck of the woods that I will be attending. Haven't been posting a lot lately. Not that I haven't been foraging...just I haven't had a lot of extra time to write about it! Perhaps you can identify. One of the most reoccurring questions that people ask who are interested in foraging is "How do I know what is in season?" While some books do in fact have lists of what to expect and when...a lot of knowing what to look for comes with practice over many seasons. It also is very helpful to get to know one area really well as you can remember where something grew the season before and watch for it to poke up and follow it through its life cycle to see what it looks like at every stage of its development. It is helpful to have people that are local to you that forage...let you know what they are gathering! As I don't have a lot of time presently to write in depth articles...I plan on just giving blurbs about the things I harvest so that people will know that the same may also be available in their area. I'm in Northern California...but others may have similar conditions based on climate...elevation...etc. So...today I harvested Shaggy Mane mushrooms from my sisters backyard! I was helping her move and spotted them by a willow tree along a barked border. I cut them close to the ground with my pocketknife that I always keep in my pocket then put them into a damp cardboard box that was sitting out in the rain. I do not consider myself very knowledgeable about the world of mushrooms...but the Shaggy Mane is one of a handful of mushrooms I am not afraid to harvest and eat. I hope over time to become more proficient ID'ing other mushrooms. By the time I got home (6 or 7 hours later!) they were visibly starting to get inky. I rinsed them off. There was a little dirt and some ants that seemed t find the mushroom desirable. I cut off the inky parts and then sauteed them in a small pat of butter. Guess what it tasted like! A mushroom! Perhaps my taste buds aren't that educated...and I'd be taken to task for by a mycologist for not being able to describe its distinct taste...but hey...it was good!...and free! and it didn't have any of the garbage chemicals that I have heard are sprayed on the button type available at the store. There is a lot on the internet about these mushrooms. Poke around and you can learn plenty to help you be confident with the ID. Happy mushrooming! A showy flowering plant now covers the hillsides near my home in the Sacramento Valley in a blanket of pink. 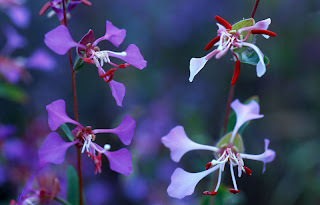 The pink comes from the blossoms of Elegant Clarkia.Here is a great site that has photos and ID info. I have heard it confused with Fireweed...and I can see how that would be as they are similar...and both come from the Onagraceae family and share similar characteristics. There are also obvious differences with the flowers...Clarkia has the 4 red stamens that stick out...and 4 that are less bright and are shorter. 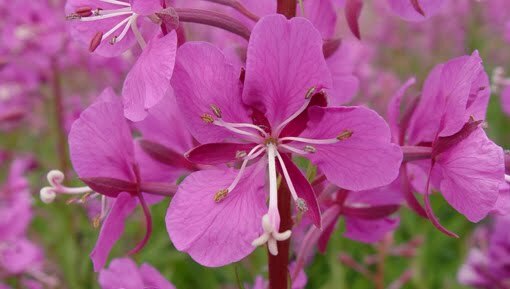 Fireweed has what appears to me to be a lance shaped red calyx that sticks out almost like additional petals that Clarkia does not have. The petals on the Clarkia seem to generally have a much more "paddle like" shape than the Fireweed does. The Clarkia genus is pretty large...and has at least a few species that are similar in appearance to the unguiculata. A perusal of some photos on Calflora should help you see which one you have. It would appear that this species is the most widespread across the state...of those that look similar. The scent is also quite intriguing to me. To me it isn't a real "florally" scent...but seems like a scent of a plant from the desert. Like a sagebrush or something. I like it! "Clarkia (Clarkia elegans Dougl.). Sokowila (C). The seeds were collected in a finely woven burden basket (tcikali, C) with the aid of a seed-beater. After drying they were parched and pulverized in a mortar. The meal was eaten dry with acorn mush. Sometimes the whole plant was dried and the seeds removed later. " "Parched, pulverized seeds eaten dry with acorn mush." As they haven't gone to seed as of yet this season...I have yet to try this one out. Perhaps soon I will have an acorn mush and Elegant Clarkia seed feast! All over the hills here in Northern California right now is a lovely flowering plant called "Ithuriel's Spear"...or Triteleia laxa. The corms (underground root part) were used for food by natives. Raw...they have a nice clean crisp waterchestnutty kind of texture and taste. Yum! I have yet to try them cooked as many of the tribes apparently preferred (according to Moerman). For now...I would consider these more of a survival type food. While I would love to go out and dig up baskets full of corms for dinner...there are gaps in the knowledge regarding how long it takes for them to reproduce. Perhaps I will need to grow some myself at my home like this author suggests...and I will find as she did that they "Multiply easily". Until I do...I will probably just enjoy the flowers in the wild...and maybe sample one if I am really hungry...and in an area with multitudes of the plant. Here is a wonderful article on the US Forest services site that gives some great ID info...distribution maps...and fun information on the name. Enjoy! The basic template for the recipe came from my favorite bread book..."Bread Winners" by Mel London. Available used on Amazon for change and some shipping. If memory serves me correctly...my daughter and I did the recipe like above...only we subsituted Interior Live Oak (Quercus wislizeni) acorn flour for a little less than half of the wheat flour it calls for. There are all kinds of places on the internet that give various ways to prepare such flour. We also used white wheat that we ground ourselves...so it was nice and fresh which I think makes a difference. We mixed everything in a large bowl...poured batter into greased some muffin tins...and cooked at 425 degrees for 15 minutes. Occasionally...I take groups out to ID native plants and discuss their uses for food...medicine...and tools. I show how my family currently supplements the store bought foods that we eat. I have done these walks enough times now...where I regularly have people asking me "When are you going to do that again! "..or they say "Let me know when you are going harvesting so I can go with you!" So in response...I have created a project that I call "Sacred Garden School of Foraging". The name is meant to remind that the worlds bounty is "Sacred" as it comes from God and should be observed and used with reverence...and it is a "Garden" that should be tended with care so that it produces good fruits continually. As a "School" I will be providing the quality of instruction that I would want if I went on a foraging walk with another teacher! My intent is to regularly (perhaps monthly depending on my schedule) take people out to help them correctly ID and use the "wild" plants in my region. To help people have a good experience by harvesting the correct part of the plant...in the correct season. To hopefully help them understand the many reasons why they ought to continue to forage. Teaching information that is steeped in the knowledge of the Native Americans...modern foraging teachers...as well as my own observations. 1. Family and general plant info classes - I will do these by request if you contact me and set up a date and provide the group. I ask that the class have no less than 5 people...and no more than 15. The class will be an overview of many plants. 2. Intensives - Adult only classes where we will study a plant or two at a time...IN REAL DEPTH. How to identify it...how to harvest it...how to prepare it...native uses for it...medicinal uses...it's history in the US...etc...etc. This is the way that foraging skills should be learned...a plant at a time. After the class...the students should be able to stand before a group of botanists and swear on their lives that they can correctly identify a plant and know how to use it! at the gravel parking lot below the "Hinkle Creek Nature Center". We will be focusing on Curly Dock (Rumex crispus) and Thistles (Cirsium spp.) They are quite good right now...and we should be able to still find some in good shape on the 1st. 2. Bringing gloves if you want to touch pokey things. I am aware of people's current financial struggles. I don't want for anyone to stay home that is interested because finances are an issue. Instead of setting a price for the class...I ask that you make a discreet money donation based on your circumstances...and what you feel the class is worth. There is no amount too small or too big! The money will help to pay for my preparedness gear habit (and bills)...and make my wife much more agreeable with letting her husband leave for several hours when he ought to be at home cleaning out the garage!! Please contact me at stephenenix@yahoo.com to book your spot. PS. I am still doing free classes for groups from my church...when they are set up by a Relief Society...Elders Quorum...Young Mens...etc. I am often asked when I take people on walks to ID native plants..."What one book would you recommend to have for emergencies?" The implied question is that if the day came that they needed to rely on foraged food...what book will tell them everything they need to know to feed themselves. While it is possible that a reference book could help in a pinch to find a few edible plants to use to supplement one's diet...to expect that a person is to learn all they need to know from one book that is needed to sustain life...without a depth of experiences that are borne over many seasons of working with many plants is unrealistic. It's kind of like asking..."If the day comes that I have an opportunity to dance on broadway...how can I become a professional dancer in one weekend?" It is also like people that store garden seed for doomsday gardening...but don't currently garden...or purchase all of their plants large and healthy from a nursery. The comfort that comes with being truly self-reliant with foraging as well as in most preparedness endeavors comes with the knowledge that comes from practice. I own a library of foraging books...and when I am learning about a plant...I learn bits and pieces of a puzzle from many of them. Some of the books have great harvesting info...but lame plant identification ...or they list off 100+ plants...but only a handful will be available in your region...etc...etc. Trying to find one book that shows you all stages of the plants development...explains the qualities of a plant good for harvesting...and that doesn't leave out other important details is hard to find. None really have been a complete resource...all by themselves. I end up going on the internet and look up photos on calflora...or see if there are videos on youtube...etc...etc... Then I observe the plant through the seasons to know what it looks like at all stages of development. Some plants you want to eat when it is a tiny shoot...not when it is in full bloom like it shows in so many of the photos! But the question arises..."Isn't there a book that contains at least the info for a handful of plants that one could learn without looking to other sources?" Well...there are two that I can think of...and they are both written by Samuel Thayer. His first book "The Foragers Harvest" is worth purchasing even if only a select amount of the plants that he covers are to be found where you live. He is not an armchair forager. Not someone regurgitating what another author has written. He is telling you hands on how HE works with each plant. The photographs are crisp...the quality of the materials of the book are superb...the descriptions are complete. He provides a glossary...information on botanical terminology...really a complete reference. His new book is a dream come true! It is called "Natures Garden" and it is like a continuation of his first book. This is book is 512 pages long vs. "The Foragers Harvest" which is 360 pages. It has more plant lessons than "The Foragers Harvest" that are applicable to Western foragers. "Natures Garden" is worth buying if just for his section on Acorn processing! So...if you only had two foraging books to rely on...I'd choose for you "Nature's Garden"...followed by "The Foragers Harvest". After that...I would point you to Steve Brills book that has wonderfully correct botanical drawings and great humored info...or Christopher Nyerges book that has great info especially with regards to nutritional values...but lame photos. 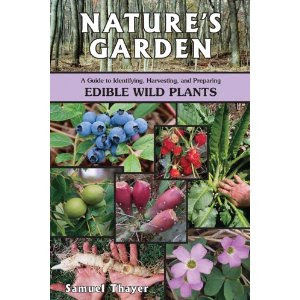 "Natures Garden" is available for pre-order from Amazon at the link above...or directly from Samuel Thayer. He will even sign the book if you buy it from him! One of the initial things that drew me to foraging was the concept of "Reaping where I did not sow". After spending so much time prepping soil for planting...sowing...weeding...etc...at my home garden foraging was bound to be inviting! I saw with my naive eyes that the world of the Native Americans must be one of simply going around and filling up their "shopping baskets" with the bounties of nature. I mean...that is what we were taught in school right?! That the Native Americans were "Hunters and gatherers"!? While they did hunt...and they did gather...they also were "Tending the wild". This book extensively documents the practices of burning...weeding...coppicing...pruning...sowing...etc...that made the State of CA the abundant place that it was when the white man came. These actions ensured that successive harvests would produce higher yields and superior quality. Native California was managed just like a modern farmer would manage a crop in rows...only their crop was "wild" to the untrained eye. Hillsides of edible clover...large stands of evenly spaced oaks...fields of cereal grains. They truly shaped the landscape of California into what it was...and we still are benefactors of their work to the extent that it hasn't been sullied. This book also serves as a stinging rebuke to those "conservationists" who believe that the best kind of nature is nature that is untouched. Management practices of the Native Americans such as burning increased crop yields...abated insects and disease...prevented larger fires...cleared brush...etc. Man's hand can actually accentuate the positive by helping along processes that lead to a desired result. 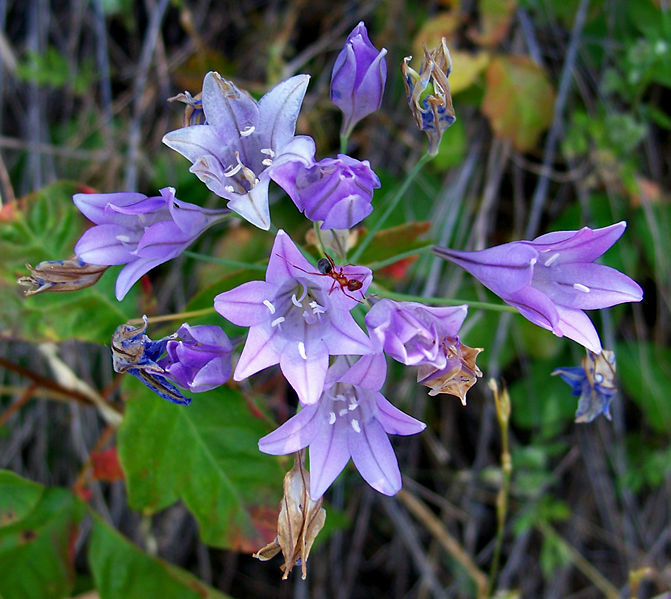 For example...the author writes extensively about Dichelostemma capitatum or "Blue Dicks" or "Brodiaea". Here is a video of a person who has some foraging videos on youtube (many of which I have enjoyed). In this video he recommends eating the stem and flower of Brodiaea...but leaving the corm. He leaves the corm saying that it is the part that is "sustainable"...saying "It helps the plant to survive". 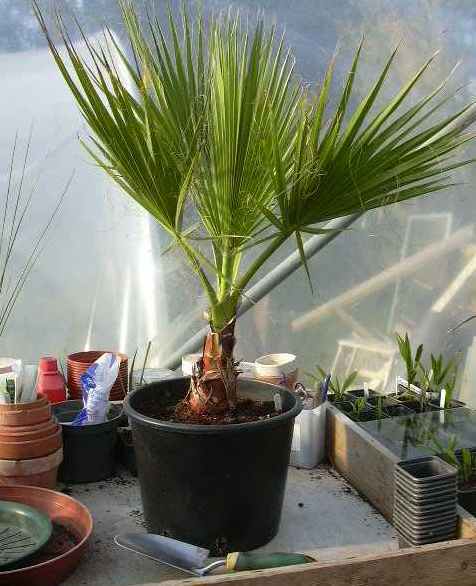 While it is true that the plant will continue to live if you leave the corm in the ground...if he were to dig it up...he would find that there would be more plants to harvest in successive years! The corms have tiny "cormlets" that detach and plant themselves when you dig them up! It is this practice of not disturbing various plants that has led to their dwindling numbers and even extinction! The book kind of felt like a fleshed out mini-version of Moerman's "Native American Ethnobotany". Where Moerman would tell you that a certain species of plant was used for food in a short blurb....this book tells you about how it was harvested...propagated...stored...etc. Many of this information comes by way of quotes from Native people telling their stories. The author also uses the botanical names to avoid confusion which is greatly appreciated. I recommend it to all people who are interested in foraging...as it reminds us that we must give thought for the future of the plants we collect. It reminds us that we are in "Natures Garden"...a garden that will produce every year...if we don't kill the golden goose. I think that although so many of the species of plants discussed in the book are endemic to California...that it also will have direct applicability to similar species found in other states and is therefore still worthy of reading if you do not live in CA. This book is a treasure. I am in awe of the knowledge of the Native American people. While much of the ethnobotanical information of the US has been lost...it is wonderful that M. Kat Andersen gave a chunk of her life to record a piece of it. I checked out the paperback copy of "Tending the Wild" from the library. It was obviously the first time the book had been read...as the binding practically creaked when I opened it. By the time I finished the book...the edges were bending up and looking worn. If this had been my own book...this never would have happened. Right after I purchase a book...new or used...before I start to read...I will cover the book with laminate. I purchase the laminate in a 12" roll from Highsmith which is a library supply place. This makes a paperback book...more like a glossy hardback book. They will last a lot longer and stay nice just by taking a short time to give the book some TLC. It's easy to do and takes me probably 5 minutes to cover one book. I'm unsure if this is the same brand I purchased before...as one roll lasts FOREVER and I have not finished the one roll I have purchased...but the 12" one on this page should be a good choice for most paperbacks. Here are instructions on how to cover a book with laminate. When spring has sprung where I live...one can step outside and hear the distant purr of lawmowers...and smell the scent of fresh cut grass. Personally...I like that scent. It fills my mind with fond memories of all of the fun things that happen in a season of warmer weather. In all the years I have been smelling that scent though...never have I thought to myself..."I wish I could have a drink of that scent!" While I still have yet to drink lawn clipping juice...I have had something that probably tastes a lot like it...wheatgrass. Wheatgrass is just that. Wheat that has been sprouted to the point that it resembles a lawn that needs to be mowed...and then it is clipped and juiced. I have yet to meet a person who drinks wheatgrass because they love the flavor. Most people drink it because it is super nutritious!! The testimonials really are astounding. 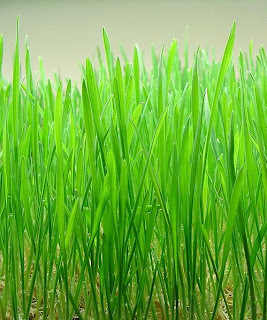 People say that wheatgrass cured them of most every ailment out there. I have no reason to doubt their testimonials. I firmly believe that many of the ailments that we carry with us are directly linked to the nutritionally lacking...and even toxic food that we eat. A blast of vitamin rich green drink could be just what is needed to revive the ill to health. This knowledge has spread...and for some time now...health food stores sell small swatches of wheatgrass sod....and businesses like Jamba Juice offer small shots of wheatgrass juice...if you have the money to buy it at a premium. People who don't want to pay the high cost...do it themselves. I've grown it in the past with plastic growing trays...some run of the mill potting soil...and some wheat from storage. There are lot's of places on online that will give you directions on how to do it. It can be done simply...or you can buy into all of the other miscellaneous things that people want to sell you to make it better...like rock dusts...containers etc. I do recommend that you do it in actual soil...as opposed to an artificial mat of nutrients like some people do. After you have the wheatgrass...you need to get the juice out of it. I own the healthy juicer...and have been pleased with it. The only drawbacks that I can think of are the plastic construction...and the suction cup that keeps it to the counter. I'd love to have one that is stainless steel and grabs the table. If the day comes that you are living on food storage...and are unfamiliar with wild greens that you could eat...this could be a way to get some green in your diet. And yes...the good ole' wheat from the cannery works just great. White or red. Just like with any seed...as time goes on...germination rates go down. I have taken out old stored wheat and tried to sprout it without much success. But you say "I heard that they got wheat to sprout from the mummies tombs in Egypt". Even if you think that story is true...I wouldn't plan on your wheat sprouting if it has been stored for over 25 years in ideal conditions. In fact...I would only attempt to sprout my newest wheat...and leave the non-sprouting old stuff for breadstuffs...because it is still good to eat...just not sprout. NOW. Having said all that...did you know that all grass is edible? Not only is it edible...but it also has a high nutritional value (according to this book). We don't have multiple stomachs like cows...and can't really handle all the fiber...but we can eat it in small amounts...or chew it to get the juices out...and then spit out the fibrous portion. Or we could juice it! The reality is that I could actually be juicing my bluegrass lawn and enjoying some health benefits! If you are going to juice grass from a wild or not so wild source...make sure that it is clean and hasn't been sprayed with anything detrimental to your health...and harvest the grass before it forms it's first node. After that node (or knee) forms it is still edible...but more fibrous and less nutritious. Harvesting wild grasses could save you the time...money...and effort of having to grow your own...with similar results. I'm going to juice some grass from the yard tomorrow!! I went into my backyard and used some scissors to snip some grass from an untrodden area. I filled up a mixing bowl and then juiced it. It was a deep green...and was much more pleasant tasting than wheatgrass has been. My wife mixed in some apple juice...and it was quite tasty! It also dawned on me how someone could have a source of water most anywhere...with a simple hand crank juicer and some clumps of grass! I am unsure of the species of grass that I drank...as I am a grass identification rookie. I am left to wonder how the nutrition of various grasses stack up against each other. I wonder if that information has been published?! I will continue to drink it knowing that it is generically "highly nutritious". Yesterday...my eldest daughter and I parked at a car wash...and walked a short distance up a trail in a forested area of the city. On our way we saw Toyon berries...Black Sage...Black Alder...and a host of other wild edibles...but that wasn't what we were stopping for...we wanted some pine nuts. Pine nuts are high in nutrition. They are not cheap to purchase at the store...so free is great! While they are well known for their inclusion in Pesto...it is also used in many other recipes (including salads, sauces, fish garnishment, puddings,cookies, cakes). P. coulteri ("Coulter Pine") Mostly Southern CA...a little of Central CA. P. lambertiana ("Sugar Pine") - Found in California and S Oregon. P. monophylla ("Single-leaf Pinyon Pine") E & Central California, Nevada, W Utah & Baja California Norte. P. quadrifolia ("Parry Pinyon Pine") Far S California & Baja California Norte (mixed with above). Up the road in Tahoe one can find Pinus Lambertiana or "Sugar Pine". As a result of their presence there...many Tahoe sites are named "Sugar Pine" Point..."Sugar Pine" restaurant..."Sugar" Bowl...etc... They hold a couple of records in that they are the worlds largest pines...with the longest pine cones! The pine cones are so remarkable that people sometimes sell undamaged specimens at fairs for top dollar. While these do have edible nuts...they aren't widely harvested...as the tree is just too darned tall to take down the cones! One has to be content with what is leftover when they fall from the tree. In my immediate region...the one that is everywhere...is Pinus Sabiniana...or "Gray Pine". 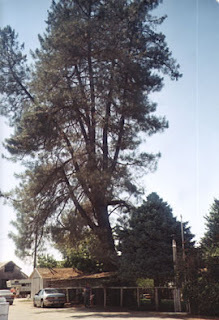 This same tree is also known as "Digger Pine" (which may be viewed as politically incorrect)..."Ghost Pine"(because of how the gray green needles look ghostly)...or "Foothill Pine" because that is generally where it grows. Like three good friends hanging out...you will often find the Gray Pine with it's buddies "Blue Oak" (Quercus Douglasii) and "California Buckeye" (Aesculus Californica). Thankfully...all three of these friends have use as food for humans (when prepared properly). 1. The needles are in fascicles (bundles) of 3...are droopy...and are 8-10 inches long. 2. The color of the needles is a pale gray/green. 3. They have a "pole" stage when they are young...but when they get older they branch out in forks and grow as tall as 160 feet! From a distance they are quite noticeable with their spindly dark trunks and sparce gray/green needles. See the photo above. 5. The cones are apple to pineapple in size and often have a lot of sap on them. If you desire to learn which conifers are which in CA...HANDS DOWN the best book to get is "Conifers of California" (apt title!). The paintings are beautiful...the photos are crisp and clear...and the descriptions are thorough. Other than for pine nuts...the pinus genus has many other uses. Here is a video with some tips on how to use pine trees and how to harvest pine nuts. One thing that I would add to what he said with regards to harvesting...is to not assume that because a cone has opened that all of the nuts have been released never to be found. I have found many opened cones on the ground still filled with nuts! In fact...we probably picked up $100 worth of pine nuts just off of pine cones we found on the ground in opened cones! Sometimes the pine cones would leave a nice...neat little pile of their nuts right where the cone had initially struck the ground. We also found many that had fallen from the tree...took to the wind...and were littered all over the ground. They can easily be found and eaten for free...if one doesn't mind a little bit of sap on one's hands...and taking a bit of effort to crack their little shells to expose the white nutmeat. Just the thought of having a snails chewy little meat sliding down ones tongue sounds like the makings of one of those reality shows where people are dared to do unreasonably gross things for the viewers morbid pleasure. It is an interesting exercise in self understanding to kind of step back out of ones point of reference and ask "Why do I feel that way?" "Why is it gross?" "This food is enjoyed in other cultures...why not mine?" Food prejudices that are developed in a culture may or may not be based on good reasoning. Silly superstitions...prejudices based upon a food being what "poor" people eat...or some such reason could be keeping you from enjoying what could be your favorite food! American's generally have a taste aversion to eating snails and yet the common garden snail that is to found in our yards is closer on the family tree to the clams...mussels...oysters...and squid that many eat at their fine restaurants...than they would want to hear about. I wonder if anyone would notice if that clam dip at the party was in fact a snail dip? 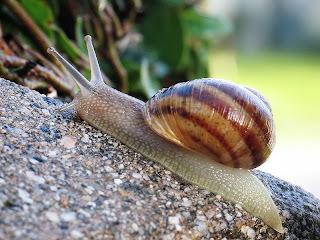 That common garden snail that we are fighting to keep from eating our garden greens is in fact the same snail that is hunted for eating in France!! It is called the European Brown or "Helix Aspersa"
You don't have to shoot! and it has some great nutritional value! It actually stacks up pretty darned well with some of the meats you probably now enjoy. Here is an article about a man in San Franciso who eats snails that will teach you a bit about preparation and give some other useful information. While some people do eat raw snails...know that you could run the risk of getting sick if the snail recently ate snail bait...or if it is carrying parasites. The simple preparation described in that article will ensure that they are safe. If the thought of eating snail grosses you out...or you say "My family would never eat it". My reply is..."Then you don't know how hungry you could get...and how desperate!" Your family might find it more palatable...first of all...if you don't tell them what it is! !...but second of all if you have it in the context of a dish like some food storage pasta! Snail Rigatoni...YUM!! A child sits in a pile of mud...making "Mud Pies". Perhaps we might tell the child "They are only for make believe! "...hoping that they don't succumb to the temptation of sampling their culinary creation. Interestingly enough...there are some circumstances under which eating mud...or "geophagy"may make sense. The main circumstance...of course...will most likely be that you are starving!! ...but there are other reasons too. 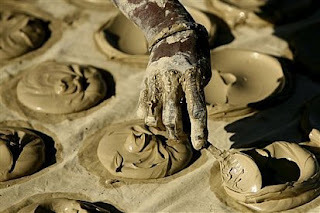 In Haiti not too long ago "mud cookies" became the common fare of people unable to afford any other food. The reporter who tried the Haitian cookies didn't like it...but there are others who love the taste of clay. Some American Indian tribes added clay to their acorn meal to bind the tannins so they could be consumed. In the Southern United States back in the 1940's...eating dirt was a common practice that came over from Africa. Some people eat it because they believe it has various healing effects...like as a cleanser of one's system. 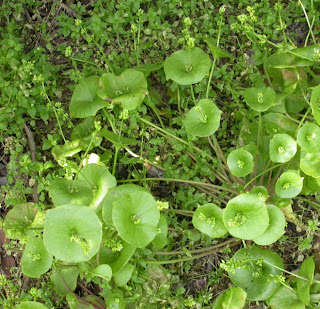 It has been used to detoxify after ingesting poison. It has also been used to relieve nausea. Pregnant women the world over reportedly can feel compelled to sample the soil...and do. Some surmise that this may be due to a drive to have certain minerals to help with the babies development. "The silt or mud on the bottom of lakes, ponds, and sloughs that have or have had some vegetation in them has a high food value for humans. Such silt or mud contains the accumulated organic food riches of thousands of years both from plants, insects, and in some cases from such things as clams, fish, and crayfish. The best way to eat such silt or mud is to make a soup. It tastes surprisingly good. Laurel leaves, wild grape leaves, juniper berries, wild leeks, or dandelion will add to it's flavor. If lost in the wilderness, mud soup alone will bring you through in fine shape. This is a proven scientific fact, not my personal opinion. The world famous scientist Robert Beauchamp, director of the East African Fisheries Research Organization, made a great many scientific tests on the food value of mud and silt from the bottoms of lakes. He found, for example, that the mud from the bottom of famous Lake Victoria in Africa was especially rich in food for humans. He proved the point by feeding himself and his family on the mud and in all cases the individuals gained weight." How would you have liked to be one of his children!!? While there may be potential health benefits of mud eating...it is not something that I would recommend to people...except in a worst case scenario sort of situation. Most would probably have to be in that sort of situation to consider it anyways! It is reassuring to know that in the absence of plant life to forage...that if it came to it...you could eat mud...and that it could actually make you GAIN weight!! Still...without a lab to test ALL of what is in the soil...you are taking a chance of consuming lead...or chemicals...or something else that is unhealthy or hard to digest. Also...eating foods with lots of grit can work like a sandpaper on your teeth. The CDC also has an article that discusses various health benefits and some sobering risks. This should hopefully dissuade casual mud eating...and make you want to become more informed about any soil you would want to consume. I'd venture to say that to become a wise geophagist...one would need to become pretty good at recognizing soil types...have a good understanding of the nutritional values of the soils...and a really adventurous foraging spirit! If one get's good at it...perhaps they will make dirt brownies! Of course...a wise geophagist probably won't even practice his craft...and will save his/her knowledge for a time of real need! Just one more arrow to put into our "worst case scenario food situation" quiver!! Walking down the supermarket aisles we see Olive oils...Canola oils...Sunflower oils...and host of other varieties that come in shapely glass bottles with fancy labels that make them look more like an expensive wine than a vegetable oil. Their neighbors are oils that while they may seem "less fancy" in their durable and yet inexpensive plastic...in my estimation...they are equally beautiful as the light passes through them. A lifetime of pushing our shopping carts by a seemingly endless supply of these oils...available at a relatively low price...could make them seem like an expendable commodity. As if they will always be there for us to purchase and use liberally. If it is our lot to go through times of scarcity...where oil has gone up in price until the average person cannot purchase it...or circumstances have made it no longer available...we may find as Joni Mitchell sang so wisely..."Don't it always seem to go...that we don't know what we've got till it's gone"! Shortening - to give pastry a crumbly texture . Flavor - while less-flavorful oils command premium prices, oils such as olive oil or almond oil may be chosen specifically for the flavor they impart. Flavor base - oils can also "carry" flavors of other ingredients, since many flavors are present in chemicals that are soluble in oil. Secondly, oils can be heated, and used to cook other foods. Oils that are suitable for this purpose must have a high flash point. 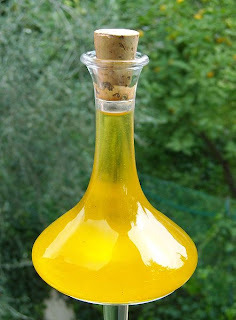 Such oils include the major cooking oils - canola, sunflower, safflower, peanut etc. Some oils, including rice bran oil, are particularly valued in Asian cultures for high temperature cooking, because of their unusually high flash point." 2. Lotions. You could even make your own essential oils from herbs and give it a scent. Many oils are quite healing applied directly to your skin without processing. 7. It can be used to treat grains for food storage to kill insects. “Church members can begin their home storage by storing the basic foods that would be required to keep them alive if they did not have anything else to eat. Depending on where members live, those basics might include water, wheat or other grains, legumes, salt, honey or sugar, powdered milk, and cooking oil." "You may also want to add other items to your longer-term storage such as sugar, nonfat dry milk, salt, baking soda, and cooking oil. To meet nutritional needs, also store foods containing Vitamin C and other essential nutrients". "Fats and oils: Some fat and oil can be found in almost all grain and animal food, but additional fats and oils should be stored. Fats are easily digested and provide the most calories for the least amount of weight of any common food. They need to be stored in a cool place and rotated frequently (see Oscar A. Pike, “Storing Fats and Oils,” Ensign, June 1999, 71). In light of this information...we should look for ways to be prepared to have oil on hand. Some oils are more healthy than others. The health conscious should be wary of using some oils. There is some conflicting information as to which is best. Researching the food value of coconut oil for example will leave you bewildered as to whom is correct as some say it is the most unhealthy oil...and others say it is the healthiest!! I encourage you to research the oils and make your own decision. Enzio mentioned that his family had success storing vegetable oil for 20+ years that was still good after that time. If you were to look around for the "experts" to tell you how long you can store an oil for...you will find that it depends on the kind of oil you want to store...how you plan on storing it...and the point of view of the "expert". For example...some would say that olive oil has a shelf life of a year or two...others for 3-4 years...while others would say that it can be stored indefinitely! I'm not really sure who is right but...here you can find some advice on how to extend the shelf life of your oils. While the information given by experts regarding shelf lives may vary...they all seem to agree that fresh is better tasting...and better for you. Even a small amount of rancid oil can make your food taste really bad...and even make you quite sick. 1. the freshest and therefore healthiest oils possible. 2. the possibility of having oil still available to your family...even after your oil storage is expended by a "sustained emergency". 3. the ability to make oils out of a variety of plants you may have never considered...that may not be commercially available. "One of the important keys of home production and storage is the acquisition of skills. Sometimes we may be able to buy food inexpensively, but the skills and intuitive wisdom gained through gardening and other home production projects are worth more than the time and effort they require. In a sustained emergency, basic gardening, sewing, repair, construction, and production know-how are invaluable. Provident living helps us develop these skills—and build family unity by doing it—before an emergency." The storing of any food or supply brings a level of self reliance and peace of mind that will last only as long as the food or supply does! Having the ability to produce your own food and supplies brings the possessor of such knowledge into the realm of true self reliance. It reminds me of that old saying "Give a man a fish and feed him for a day...or teach him how to fish and feed him for a lifetime". I could easily reword it to say "The store gives a man some oil and feeds him till it's gone...or he could learn to make his own oil and feed himself for a lifetime!" The prophets have long spoken the phrase "Home production and storage". While just simply storing may be an "easier" path...learning to produce what you need could prove "invaluable". So How is Vegetable Oil Made? a) Water assisted. Here the finely ground oilseed is either boiled in water and the oil that floats to the surface is skimmed off or ground kernels are mixed with water and squeezed and mixed by hand to release the oil. b) Manual pressing. Here oilseeds, usually pre-ground, are pressed in manual screw presses. A typical press is shown in diagram 1.
c) Expelling. An expeller consists of a motor driven screw turning in a perforated cage. The screw pushes the material against a small outlet, the "choke". Great pressure is exerted on the oilseed fed through the machine to extract the oil. Expelling is a continuous method unlike the previous two batch systems. d) Ghanis. A ghani consists of a large pestle and mortar rotated either by animal power or by a motor. Seed is fed slowly into the mortar and the pressure exerted by the pestle breaks the cells and releases the oil. Ghani technology is mainly restricted to the Indian sub-continent. e) Solvent extraction. 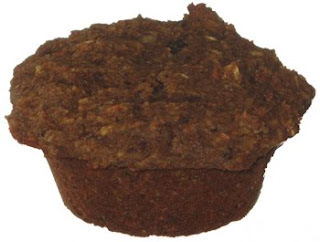 Oils from seeds or the cake remaining from expelling is extracted with solvents and the oil is recovered after distilling off the solvent under vacuum. My own belief is that the second one on the list...letter "b" is the best for preparedness. I will share more on why later. Here is a great article on how to process oil seed. This is one that I will print out to have as a reference. Here is yet another on processing oil seed on a small scale. Which Seeds and Nuts Are Used For Oil? It really is remarkable how many seeds and nuts can be processed for their valuable oil. Wikipedia has a wonderful list of various vegetable oils and their uses. On that list you will find many seeds and nuts that you are probably currently tossing in the trash. Seeds that if you simply set them aside to dry out...you could be pressing them for their oils. You will also see some on the list that can be gathered from wild sources. I first started to research this when I found out how high the oil content is in thistle seed and how it can be pressed for it's valuable oil. This would be a great list to print off a hard copy of...to have on hand to remember what seeds you can use and their applications. You may already know that I believe that acorns are one of the most underutilized food cropsavailable in America and much of the world for that matter. There is information out there on how to use the acorns as a meal...but really not a lot of information on how they can be used for their oil. This could lead one to believe that it must not be a feasible option if "everyone isn't doing it"...and yet the information that is available on acorn oil makes it out to be a great oil! "Acorns can also be used to make acorn oil by boiling, crushing, or pressing. Acorn oil has been used as a cooking oil in Algeria and Morocco (Loudon, 1844; Hedrick, 1919; Smith, 1950). It was used by the Indians of the eastern U.S. for cooking and as a salve for burns and injuries (Michaux, 1810; Smith, 1950). Some varieties contain more than 30 percent oil, equal or greater than the best oil olives ( Wolf, 1945; Ofcarcik et al., 1971). The quality and flavor of the oil is comparable to olive oil (Wolf, 1945; Smith, 1950; Bainbridge, 1985a). Table 4 presents further information on acorn oil." A study by the American Chemists Society said that acorn oil could "satisfactorily be used for edible purposes". Isn't that remarkable! Those little acorns that fill green waste bins to overflowing can be made into an oil that has a "quality and flavor..comparable to olive oil"!! With the long term storage capacity of acorns...it is conceivable that a person could store enough acorns to eat as a meal...or to produce whatever oil you would need for the season or more. Although none of the sources I found indicated if it was necessary to leach the acorns first...I communicated with Green Deane who told me that "You get a better tasting oil if you leach it first". In hard times...acorns may be a primary source of oil for those who can make it. It is my intention even now...as the acorns start falling this season...to make it the primary source of oil for my family. The best (in my opinion) oil expeller will be one that is easily transportable...does not require electricity in case there is none...is fairly priced...doesn't wear out or require a lot of cleaning...and can expel a wide variety of seeds and nuts. From my research...the one that fits best into all of these criteria is the Piteba Oil Press. A longer video making hemp seed oil...read the comments someone made on acorn oil. The cost of olive oil right now is roughly $10 a liter. The cost of the Piteba oil expeller is approximately $140 shipped. Which is an AWESOME price!! Especially when you compare it with some of the more complicated motorized versions that cost thousands of dollars. Make 14 liters of oil that you would have purchased and used anyways...and you will have recouped your expense...and the rest is gravy! If due to crop failure...a drastic devaluation of our currency...breakdown of shipping...war...etc...the price of vegetable oil shoots through the roof...you may be able to recoup the cost with just one liter made! It is interesting that we could go to the store and easily pick up $140 worth of groceries that disappear quickly from our pantries and think nothing of it. And here $140 may sound like a lot of money for a tool...and yet this is a means to make an unlimited amount of food! As I look at it...I am buying the cornucopia of cooking oil...lotion...fuel...medicine...etc...for a small price. There is a price break if at least 4 are ordered. The owner told me that the price break comes on shipping when he can send presses together. Which would make the final price less than $140. There is a chance that our government will want to tax the items coming in from the Netherlands where they are made. I have been unable to confirm or deny how much that tax would be or if it even will happen...but don't put it past our government to have ways to gouge imports. The final cost should be less than the $140. Plan on paying that amount...but be pleasantly surprised if I can refund you some money! If you would like to purchase one...please contact me at wfgsnix@yahoo.com and let me know how many you would like and your contact info. I have done many group orders in the past...and my experience has been that a lot of people keep trickling in wanting to order up until the last second. The last time I did an order like this I expected to order maybe 10 or so cookstoves...and we ended up with an order of 70+ stoves! This happens as families email families and it takes a while for the word to get around. Here is how it will work. I will keep a list of people and their orders...when we have at least 4 people ordering...I will contact you to let you and request that you send me $140. I will gauge if orders are still coming in and make the order when money has been collected by all interested parties...no later than Friday July 31st. Then I will pay for the group purchase via paypal. The presses will be mailed to my address...I will tell you when they arrive...and then we will arrange how you will pick it up or perhaps have me mail it to you. As a bonus to whomever buys a press....I will invite you to my home this fall...and do a free workshop on how to process acorns for food and we will try our hands at making some acorn oil! Then we will make some food out of the product we make! YUM! Heck! Just the class will be worth the cost of the press! In closing...almost inevitably I am asked after I do a group order...if I will be doing it again. The answer is "No". In this case I just plan on having one press...so I don't plan on organizing another order for a group. If you want an oil press...you may not want to let this chance pass you by.